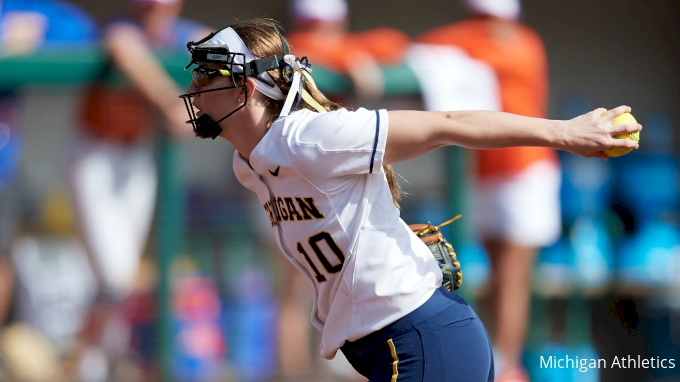 The University of Michigan softball team earned his biggest win of the 2019 season in comeback fashion, plating three runs in the sixth inning to upend No. 2-ranked UCLA, 3-1, in its first game of the annual Judi Garman Classic on Friday afternoon (March 1) at Cal State Fullerton's Anderson Family Field. It was the Bruins' first loss of the season. Sophomore left-handed pitcher Meghan Beaubien (3-3) was outstanding in the circle, allowing just one run off three hits -- two coming against the first two batters she faced -- and no walks. She struck out three and allowed only four total baserunners in the contest, including two over the last six innings. Michigan took advantage of free bases to initiate its rally in the sixth inning when a leadoff hit-by-pitch and a throwing error off a bunt single from Natalia Rodriguez put two in scoring position with no outs. Senior second baseman Faith Canfield came through in the clutch, driving a two-run single up the middle and under the glove of the diving UCLA second baseman. Freshman left fielder Lexie Blair tacked on another run two batters later, scoring Canfield from first on a double to the wall in left-center field. Beaubien needed just eight pitches to end the contest in the top of the seventh -- and despite a one-out fielding error putting a UCLA runner aboard. She responded with a first-pitch fielder's choice back to the circle and an unassisted groundout to first for the final out. UCLA scored its run on a fielder's choice after back-to-back singles to lead off the game. Canfield made a diving play to keep the ball on the infield and get the out at second base, but a fielder's choice in the preceding at-bat had put the lead runner at third and she scored easily on the play. Another groundout to Canfield ended the first inning. Beaubien did not allow another baserunner until UCLA posted a two-out single up the middle in the fifth. After the Bruin runner stole second to move into scoring position, Beaubien responded with a four-pitch strikeout to end the threat. The win was Michigan's first over a ranked opponent this season. The Wolverines already have faced four top-10 opponents in No. 5 Florida, which UCLA defeated, 4-0, earlier Friday, No. 7 Arizona and No. 9 LSU.